Oftentimes, clothing takes center stage when it comes to discussions about fashion. Yet, follow the editorials in fashion magazines, runway reports from New York’s Fashion Week, or the most popular bloggers and you’ll see that accessories are just as important in defining a look. Whether your style is classic and refined or bohemian-chic, a world of accessories is just waiting to take your style to the next level. From the classic jeans and t-shirt to a stunning evening gown, every outfit is instantly upgraded when paired strategically with the right jewelry. The style and design of jewelry has the ability to transform: it can turn a casual top into a dressy piece, or take a classic blouse and instantly add an element of edginess. In the 1930s, famous designer Coco Chanel chose pearls to give her designs the “Chanel look” that continues to dominate runways, boutique clothing stores, and magazine covers today. You can follow her lead, too: add a glitzy diamond necklace to make any dress ready for an evening event, or wear multiple chains, beads, and bangles to evoke the boho vibe. An artistic piece of jewelry can also become your go-to piece, allowing you to create your own unique style for everyday looks. 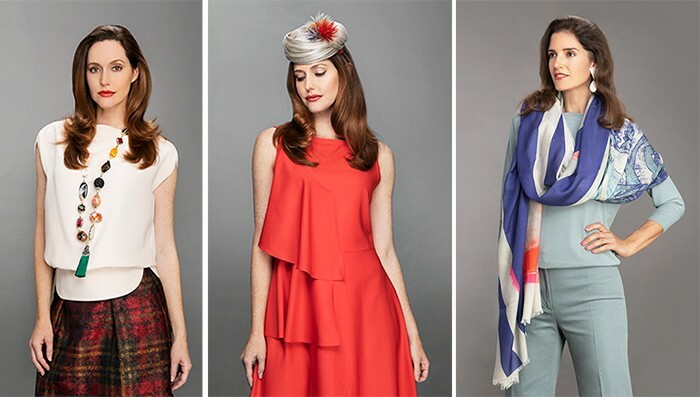 Famous hat designer Philip Treacy said, “How a hat makes you feel is what a hat is all about.” Indeed, a fashion hat can glam up your look. After all, how often do you see British royals without one? Weddings and special occasions provide the ideal settings for these high-fashion accessories. Of course, you don’t have to be going somewhere special to don a hat. From a wide-brim hat for your next getaway to functional Panama hats perfect for brunch or running errands, boutique clothing stores have a wide array of hats to suit your unique style. Scarves are among the most versatile accessory options available. Thanks to French designer Hermès, who introduced fashion scarves in the 1930s, wearing a scarf has long been associated with the look of luxury. Nowadays, however, you can find scarves ranging in style from casual to functional, all with the ability to perfectly accent and dress up any outfit. To ensure your scarf complements instead of clashes with your look, choose a solid scarf if you’re wearing a print. If you’re wearing solids, however, feel free to mix in prints in complementary color tones.